Secretary Jewell- Protect Polar Bear Habitat ! PLEASE SIGN ! ! 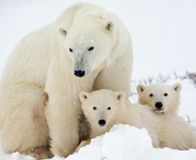 The Obama Administration is attempting to rush through a new plan that would allow oil and gas drilling in Alaska's Chukchi Sea -- home to half our nation's polar bears. #23. Noted, signed and shared. Signed and noted. Thanks very much, Cher and Nyack! Victoria,you took action on September 13, 2013.